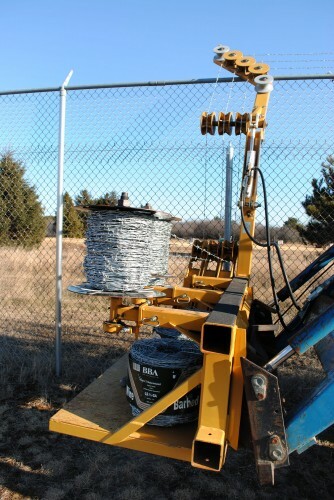 The Barbed Wire Dispenser manufactured at L&C Enterprises-USA dispenses in half the time three strands of barbed wire for high security applications or two strands of tension. 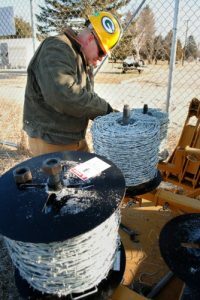 It separates three rolls of barbed wire to prevent tangles, and the upper guide rollers perfectly space them to fit the dimensions of barbed arms at the top of the posts. 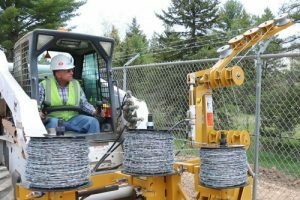 You can control and adjust the tension for the ideal fit. 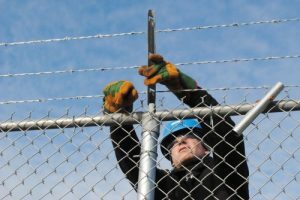 In a highly competitive industry, fence installers are constantly looking for ways to cut time and labor from jobs. 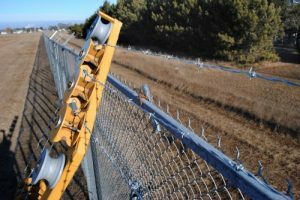 Barbed wire installation and stretching can be especially time consuming, making it difficult to produce low bids. 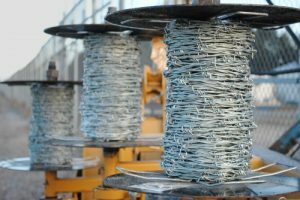 Manually dispensing wire is slow, can cause tangles, and may result in injuries to workers. 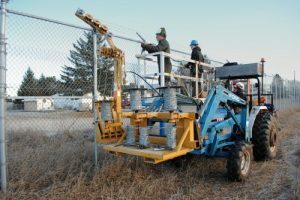 However, by using an automated barbed wire machine, you can speed up installation by dispensing several strands of tensioned barbed wire at the same time with a smaller crew. 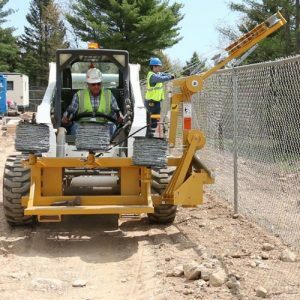 The increased speed results in more competitive bids and higher profits. 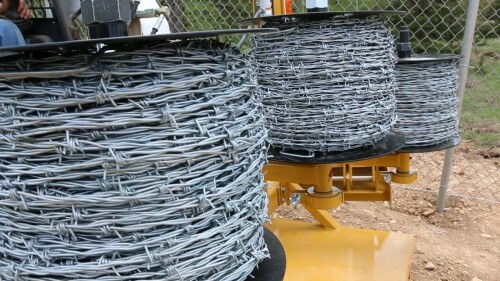 The Barbed Wire Dispenser easily hooks to a skid-steer for simple and fast installation. Simply secure the wire to a termination post and drive forward to dispense the wire. 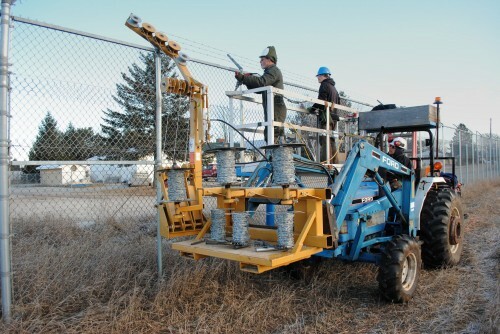 It converts easily to dispense tension wire to distribute at the top and bottom of the fence. 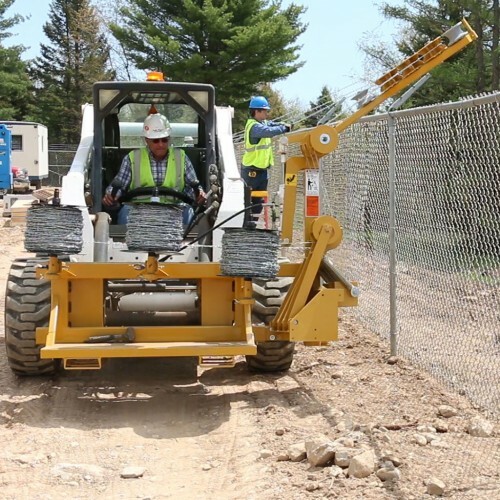 Because the unit is able to carry extra barbed wire or tension wire rolls, changing rolls is more efficient, eliminating the need to carry heavy rolls. The Barbed Wire Dispenser is designed to dispense from the left or the right side and accommodates 6 foot to 12 foot fence heights for most commercial installations. The durable Barbed Wire Dispenser is powder coated for long life. Do you find yourself in a tangled mess? 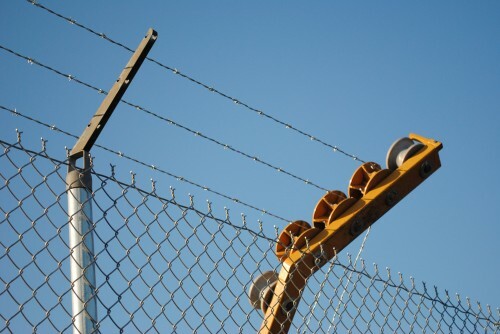 We can straighten you out if you give us a call. Ideal for commercial chain link fence installation in high-security areas. 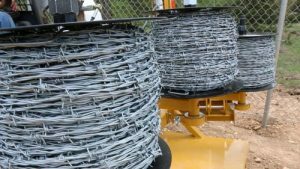 Not meant for farm or ranch applications. 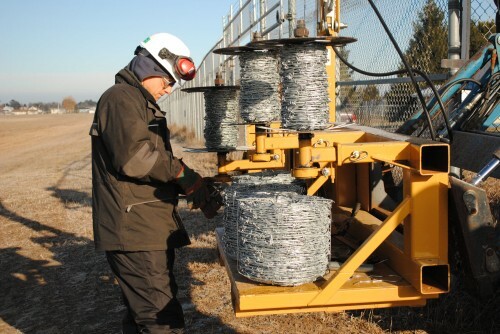 The Barbed Wire Dispenser was developed by industry experts with practical experience in the field. There is no other piece of equipment like it in the fencing industry.